Black Friday? Let's make it green! Dear Absintheurs, everyone is talking about Black Friday, but why not make it green..? At ALANDIA we have the Green Weekend, this means for the next 48 hours you can use the coupon code GREEN10 and you will get 10% OFF on all the products. This gives you the opportunity to already buy some Christmas gifts or one of our new Absinthes like Absinthe ALANDIA Verte. Green greetings from the World of Absinthe! We at ALANDIA offer a large selection of real Absinthe as well as a large assortment of authentic accessories. We have it all: Spoons, glasses, fountains, sugar cubes, poster, even vintage Absnthe is for sale in our online store. Buying Absinthe online at ALANDIA is safe and very convenient. We accept Paypal and all major credit cards. Shipping to the USA only takes 2-3 days (Courier Express). The rest of the world is served in 10-12 days, Europe in 3-5 days. Which Absinthe should I buy, what are the differences? There are a lot of different brands on the market, as many distilleries have started to produce Absinthe within the last years. To orientate in the world of Absinthe you can say, that an Absinthe is different in terms of its production process. You can get distilled or macerated Absinthe. You can buy crystal clear, green, black and even red types of this alcohol made with wormwood. Additionally, the degree of alcohol and wormwood can be different. Strong brands have up to 89.9% alcohol and 35 mg thujon. But we have to mention, that thujon / wormwood is not the major thing about this drink. You should respect and appreciate the deep culture of this drink. Furthermore, you should drink it responsibly, as this spirit has more alcohol compared to other spirits (68% alc. by vol vs. 40-45% alc. by vol. in a whisky, vodka or rum). But always have in mind, Absinthe is not a hallucinogenic drug, despite its reputation of being so. Real Absinthe contains of course wormwood and wormwood can set free thujon, once it is distilled. But the amount of thujon in the drink is very low. What you will feel after 1-2 glasses of Absinthe is more the alcohol and the effects of all the herbs being distilled. In this sense, Absinthe can give you a slightly activated state. But don't expect to see pink elephants. This is not what Absinthe will give you. And also don't think that Absinthe in the 19th century had more thujon than today, this is a myth. Vintage Absinthe was chemically analysed and the levels were comparable, sometime even lower than today. 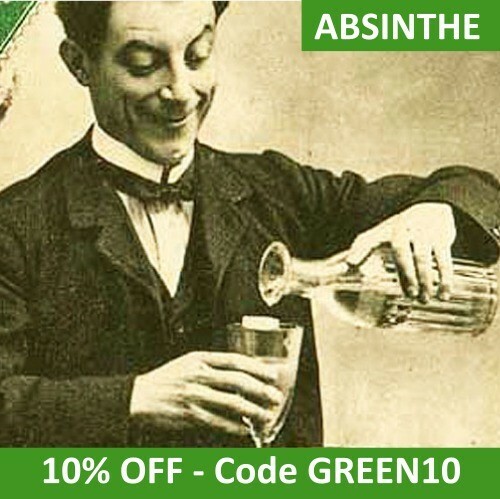 So to put it in a nutshell, Absinthe is nowadays as real as 100 years ago, and the effects of thujon are exaggerated. You should buy Absinthe because of its incomparable complex taste and its fascinating ritual and history. Absinthe simply is a legendary spirit! To truely experience Absinthe, it is necessary to prepare it the traditional way: You pour a shot of Absinthe into the glass (3-4cl). Then you put a spoon on top and place one or two sugar cubes on it (the best sugar cubes are the individually wrapped sugar cubes we offer for sale at our store). Finally you pour ice-cold water over the sugar to dissolve it and to blend the Absinthe. The Absinthe begins to louche and after a ratio of one part Absinthe with three parts water your drink is prepared. You can also check out our Absinthe ritual videos, to see the ritual in motion pictures. I want to buy Absinthe, can I do it? Yes you can, if you are over legal drinking age. In regard of laws you can state, that Absinthe got legalized in the USA in 2008. In Europe Absinthe is already legal since 1998. That's why ALANDIA could offer it already back in 2001. ALANDIA sells the real stuff. That means real European Absinthe with wormwood. Most of our Absinthes come from small-batch distilleries, that produce according to traditional methods. Many of them cultivate wormwood on their own fields, which guarantees premium quality. The ALANDIA house brands are for example distilled in France, at an family-owned distillery, that was founded in 1859. Already in the 19th century they prodcued the green liquor and therefore can look back on century old experiences and knowledge. At ALANDIA you find a large selection of Absinthe. As you will see, finding the right Absinthe for you is kind of a task. There are so many good Absinthes up for sale. We recommend to buy Heritage Verte as it is a very traditional product. It is made with premium wormwood in France, it is naturally green from its color and has a beautiful thick louche, when water is added to the drink. 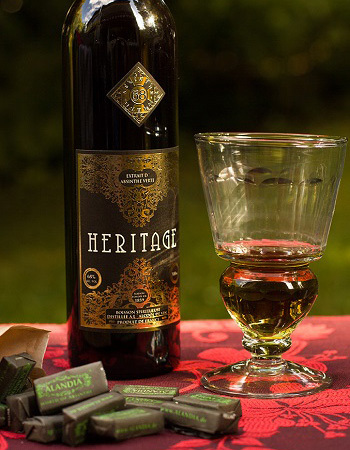 Heritage Verte is a good choice for newbies and Absinthe professionals alike. Other recommend brands are Strong68, if you like it strong, or ALANDIA Verte and Maison ALANDIA, if you like it complex and exclusive. If you are interested as well in other spirits, then check out our "other Spirits section" in the store. We have for example a nice selection of premium Gin at ALANDIA. Gin is primarily based on the distillation of juniper berries. But, similar to Absinthe, various other botanicals are added to the distillation process. Therefore Absinthe and Gin have a lot in common. We recommend that you add for example a bottle of Six Ravens London Dry Gin to your order. This is one of the ALANDIA Spirits Gins. It is distilled with fresh ginger roots and tastes delicious with tonic water. Cheers and enjoy browsing through our store!